Are you in the market for a new computer? It’s amazing how much processing power the latest ultra-light notebooks, small form factor computers, and all-in-one desktop computers pack in such small and thin enclosures. But, thinness comes with a cost—there’s nowhere for you to install PCIe cards for the additional connectivity and processing capabilities beyond what’s offered by a computer’s standard ports. Although thin Mac® and Windows® computers with Thunderbolt™ 3 ports offer processing power to spare, for many, such as pros in the creative fields, onboard processing power alone is not enough. Fortunately, your choices are not limited to desktop workstations—think external. With the Echo™ Express SE I (Thunderbolt 3 Edition), Sonnet has created a solution that enables you to connect a single PCIe card outside of your computer. 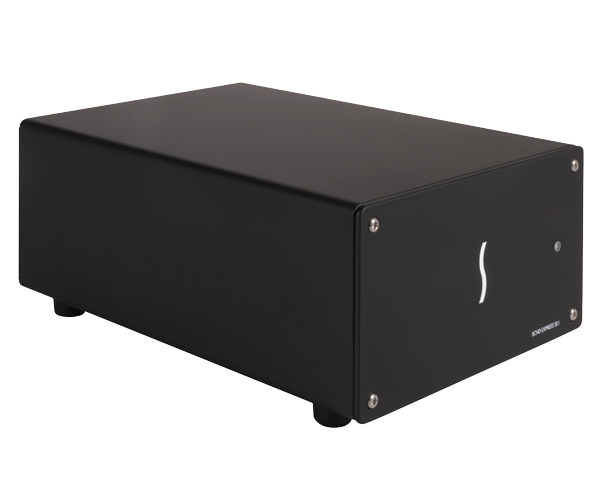 This compact desktop Thunderbolt 3 to PCIe card expansion system supports one professional video capture, audio interface, 6Gb or 12Gb SAS or SATA host bus adapter, 8Gb or 16Gb Fibre Channel, 10Gb or 40Gb Ethernet, or RAID controller PCIe card, and connects it to your computer through a thin cable.